Here it is – the latest drum news from around the web! There’s Chis Adler‘s broken-drumstick-in-the-eye story, a super groovy drums-only album by Nate Smith, TWO cool things for drummers in the United Kingdom to check out, a video dissecting a great drum groove by Ilan Rubin, and more. First up, Lamb of God’s Chris Adler talks about his biggest nightmare on stage: breaking a drumstick mid-song, and having the sharp end bounce up and stick into his right eye. Check out the interview on Music Radar… and yes, he finished the set, much to the horror of his drum tech. Nate Smith has released the jaw-dropping Pocket Change album, featuring 11 songs of absolutely nothing but drums. It’s groovy as hell, and it’s something you’re going to be playing on repeat (so prepare your headphones). Listen to it directly below via Bandcamp, or find it on any streaming service or online music store. The London Drum Show kicks off next month, from November 10 to 11 at Olympia London. They’ve released their lineup, full of world-class drummers and some really cool events (like a tribute to Keith Moon!). David ‘Pick’ Withers – drummer on legendary albums from Dire Straits. JR Robinson – has anyone recorded more tracks, ever? Honestly, look at some of the songs he’s played on. Gabor Dornyei – One of the most in-demand drummers, and a great educator. Jonathon ‘The Animal’ Rodney – The touring master, and top music director. Senri Kawaguchi – A YouTube sensation and a talented performing, recording, and touring drummer… All at 21 years old. Ron Dunnett – Drum educator, designer, and builder at Dunnett Drums and George Way Drum Company. A ton of other great drummers – check out the full lineup here. Next, some more cool stuff for UK drummers… Sky Arts has launched “The Art Of Drumming” TV series, featuring some of the biggest names in the industry. 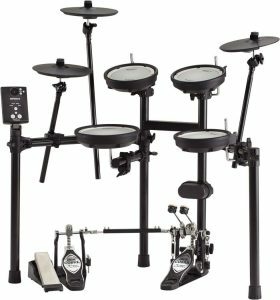 Roland recently announced a brand new electronic drum kit for beginners, the Roland TD-1DMK. This electronic drum set contains 15 built-in preset kits, a huge range of skill building tools, and access to their Melodics training software. The best feature, however, is the inclusion of mesh pads for all drums. This is a big step up from the standard rubber pads on many entry-level kits, making the Roland TD-1DMK stand out from the pack. The TD-1DMK is available for preorder; we’ll add an update once they’re released in stores. Reverb has an interesting piece on the rise and fall of Trixon drums. Known for their very weird drum shell shapes, Trixon folded in 1971 after moving from Germany to Ireland. Read the article here, and check out some of the weird and wonderful drums they created across their 24-year life. Next, check out this excellent video of Ilan Rubin dissecting The Crunge… He does an amazing job with this simple-yet-complex beat. Watch the video, then go and play it! 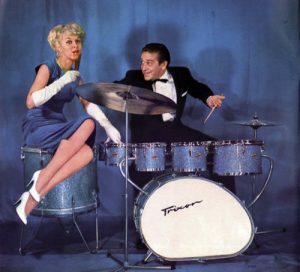 Buddy Rich would have celebrated his 101st birthday last week, on September 30! Here’s a piece we did to mark his 100th birthday last year. Coming up on October 11 are the birthdays of two jazz drumming legends: Art Blakey and Billy Higgins. Next PostNext Brand New Article: The Ultimate Guide To Resonant Tom & Bass Drumheads!